Can you visualise the mood of your virtual team? Yes, you can, with the tool today's guest is creating. 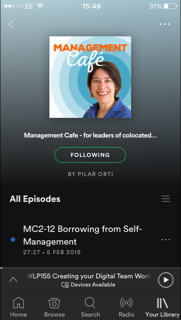 Pilar talks to Melanie Pürschel about how she's building the Mood Matrix. Melanie explains what the Mood Matrix is. How will the experience be in a team using this tool? It works well as an early warning system. The Mood Matrix shows how the mood is changing. You then need to use the information to continue the process with the Team Mood Tracker. The next questionnaire starts to help you decide in what field of the team process you need to make changes. The most important factors for virtual teamwork we should look at to understand where we could change something if the team's mood is changing. We also need to look out for the team's mood being split. Some scenarios when you might want to move onto the next stage of tracking your team's mood. Consider the bio-rhythm of people when implementing the matrix. How Melanie developed her matrix through research, started back when she was at university. The subject of anonymity. Personal and team level results. Mel's own journey and her recent partnership building the product. What is the Mood Matrix? The Mood Matrix is part of the Team Mood Tracker and this name stands for the initial MVP which will be developed this summer. It is supposed to track and show the mood of a virtual team - it would do so for any team but as remote or virtual teams do not have a coffee corner or any place to exchange about emotional or mood topics - this will be the place. It can work as some kind of early warning system if you collect the weekly entries and look at it as a trend. This trend may show a cloud/cluster of entries getting bigger (team is diverse in mood) or smaller (team is very homogeneous) or the cluster is wafting through the matrix which shows some diffuse changes in mood. If the cluster is wafting to a 'negative' corner you might want to talk to your team as a team leader - or just use the weekly trend as an additional information in your sprint retrospective if working as a scrum team. What's the story behind the Team Mood Tracker, how did you end up deciding this is what you wanted to be spending your time doing? At University I did a lot of research in the field of virtual team work in Work & Organizational Psychology department. I definitely enjoyed that research work but felt that I need to gain more "real life work experience". I then had been working in (partly) remote teams for 8 years right after university - developing portals and software for HR departments of business customers. This combined psychology and the field of human machine interaction (HMI) as well as user experience design. Last year I decided to leave my job to develop my own "solopreneur" product as a lean start-up based on both my research I did years ago as a basis for further development as well as my practical work experience in remote teams with ups and downs. This is proving much less stressful and much more rewarding for me this work now will hopefully lead to happy remote teams soon! Ideally for me offering the Team Mood Tracker (with the Mood Matrix as a part of it) will lead to some basic income with the Team Mood Tracker plus some income generated by consulting remote teams for setting up such teams or getting better at what they are doing. From your research, what do virtual teams struggle with? After my psychology studies I directly stepped into a heavy load job with many IT projects, excellent prospects and a lot more to learn for me. Having eight years of experience in IT conceptual design, UX and leading workshops for business customers and developers I decided to be a Solopreneur last year. Working on my own project now there are other challenges for me – such as being one person responsible for everything: marketing, IT, design and all the organizational stuff around. The trick is to find business partners to support each other. I absolutely love that way of work! Being an employee I worked in remote teams very often. I came through all ups and downs of virtual team work. I really missed the small talk and colleagues around me having a chat, wanting some motivation or handing over some tips and tricks. That made me think what could support remote team work additionally to project management tools such as trello or slack. Now I combine my psychological knowledge with the project and IT experience to develop something completely new: Mood Matrix will help management 3.0 companies and start ups to get a deeper insight in their teams to support their work better than ever. Mood Matrix visualizes your remote team’s mood. It provides you with a deeper understanding of what’s going on under the surface of your online meetings. Nevertheless – it’s fun using it! Get back to me for more information or get the newsletter.